Motorcycle Power Valves Repair, Cleaning Tips. Your Motorcycle Power Valves help ensure peak performance by means of their ability to block loss of the fuel volume loss at higher speeds. Its a nasty, hot job with a sticky, gummy residue reward - that leads to a loss of power - so, cleaning them is the right service for them. While this site is where to purchase additives for fuel cleaning and friction reducing tips, http://www.dansmc.com/powervalve.htm is the place to go, if you need to disassemble your power valve for cleaning. Dan goes into great detail, with a lively explanation of the purpose of your motorcycle power valves, exact cleaning tips, and the best way to proceed to the cleaning process. As a biker all my life, starting out at age 13 with a cool..
Whizzer bicycle-equipped motor, to play and run my paper route in. Then at 16, with what you would call a customize chopper 3 speed, made for a sidecar, but not with one, 50's Harley 74 flat head - with a suicide clutch - wow, what a bike! A shame to say, got 125 traffic tickets for trying to evade a police car down Los Angelos city streets at 125 miles an hour - and lived to tell about it - wrecking the English Black Shadow bike doing so, owned at the time. 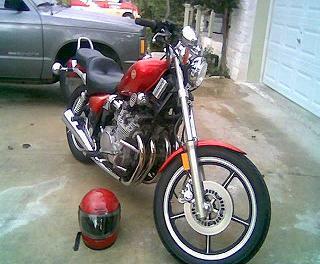 Now a days, I’m riding the Texas highways on a 1984 Yamaha 750 4 cylinder Maxim is my good ride. and, so is my 1996 Honda Shadow 650 XLM. In those days, I would add Justice Brothers Brand gas treatment to the fuel every 2-3 weeks, and keep their JB Engine Tune Up, and JB Gear Oil Treatment in the motor oil, gearbox and chains. And now, I install and favor the Mega Power Brand Gas and Oil Treatment with MC+. Mega Power keeps my cars and trucks and in my 84 Yamaha Maxim, and 1996 Honda Shadow motorcycle motor and carbs and combustion areas clean, friction reduced, and even protected with their great new, water thin, and slippery anti-wear MC+. I don't like nor use those thick, gummy, honey-like part store additives, as they are proving harmful. Nor detergent additives. Mega Power is a Hi-tech chemical oil and fuel conditioner, fortifier, and includes metal conditioning ingredients [anti-wear] found to actually stop metal migration - the fastest, most destructive type wear. Mega Power neutralizes fuel acids and makes any condensation in the tank harmless - Mega Power does so bytaking out the water suphur in needs toform acids. Mega Power makes water in the tank mix and become burnable - keeping both the tank, filter, motorcycle power valve, and carburetors free of gums. The little known secret to a trouble free car, equipment, and motorcyle power valve life. Mega Power avoids the common dirty conditions and friction that smart racers have learned to keep in their bikes, avoiding motorcycle power loss, keep piston and piston rings free, keep intake and exhaust valves clean and snappy, and our motorcycle power valves clean longer. Mega Power keeps your bike working at peak efficiency, starting easily after a while parked, and for many more months and miles longer, zip and performance enjoyment. Mega Power is a RARE AND IMPORTANT CROSS-OVER ANTI-WEAR. Learn more about Mega Power additives for motorcycles and order them on line. Have the secret to better running, longer lasting cars and equipment. More motorcycle power valves tips, info, products for your bike and cars.